Oct. 29 – In June of 1968, Dean Moorehouse and Brooks Poston left Ukiah, California, driving south on Highway 1, heading for a place called the Spiral Staircase house in Topanga Canyon. When the pair arrived in Los Angeles, they drove up to a semi-abandoned house on Topanga Lane, where they were greeted by redheaded girl named Lynn Fromme. “Dean said he was looking for Charlie and she said, ‘Okay,’ and she jumped in the car and she took us to Dennis Wilson’s,” said Poston. Charlie had become a regular at Dennis Wilson’s Sunset Blvd house ever since the Beach Boys drummer had picked up Manson family members Ella Jo Bailey and Patricia Krenwinkel hitch-hiking. Moorehouse and Poston eventually move into one of the back houses, taking on the landscaping duties around the property. Later that June, Dennis Wilson himself was hitch-hiking down Sunset when he was picked up by Charles “Tex” Watson. Throughout that summer, Watson became a fixture at Wilson’s house, and by August he had moved in. At Wilson’s house, Watson became friends with Charlie and the girls. As well as spending a lot of time with Dean Moorehouse, even though the balding minister was twice his age. Through Wilson and Jakobson, Tex met Doris Day’s son, television and record producer, Terry Melcher. At the time, Terry was living at 10050 Cielo Drive, a secluded hilltop home in Benedict Canyon. Melcher could remember at least six times Watson had been to his Cielo Drive home that summer. By summers end, the party at Dennis Wilson’s Will Rogers house was over. Dennis was going back out on tour and the lease on the house was set to expire. Dennis’ manager told everyone to leave. In late August, Dean Moorehouse borrowed Terry Melcher’s Jaguar XKE and drove to Ukiah to go on trial for a LSD arrest back in May. Tex had nowhere to go, so he accompanied Moorehouse for the trip up the coast. The trial lasted two days and resulted in a hung jury. Despite objections from the District Attorney, Moorehouse – who showed up to court barefoot – was released on his own recognizance. Tex and Moorehouse spent a few weeks in Mendocino before returning to Los Angeles, showing up at the Spahn Ranch. After New Years of 1969, Terry Melcher and his girlfriend, actress Candice Bergen, moved out of the house at 10050 Cielo Drive. The property was vacant for a month-and-a-half before Roman Polanski signed the extended lease on February 12th. For years, many have said Gregg Jakobson arranged for Dean Moorehouse to live in the guesthouse of 10050 Cielo Drive between the time Melcher and the Polanski’s live there. Supposedly, Tex Watson was to have spent much time at Cielo Drive during this time. But according to Jakobson, it never happened. But not only did it never happen. It never could’ve. On Tuesday, December 17, 1968, a Mendocino Superior Court jury found the 48-year-old Moorehouse guilty of selling $50 worth of LSD out of his trailer in Redwood Valley. Two weeks later, on Thursday, January 2, 1969 – the day after Melcher moved out of 10050 Cielo Drive – Dean Moorehouse was sent to a California state prison to begin serving his time. 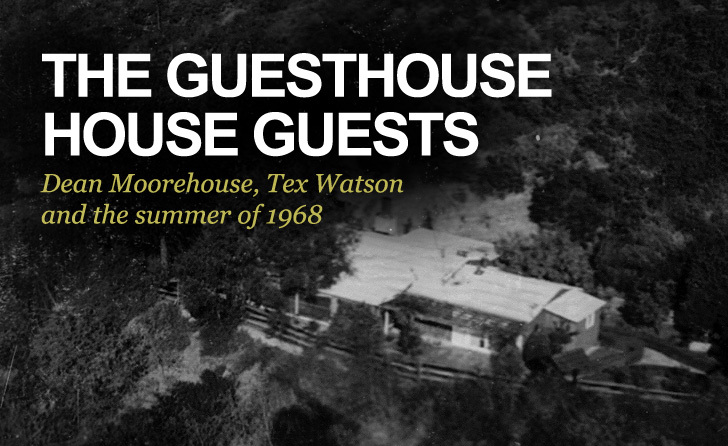 Thanks for the clarification on two fronts: that Moorehouse didn’t stay at the Cielo Guesthouse and that Watson DID spend at least a half dozen times at Cielo courtesy of Dennis Wilson and Greg Jacobson. Nice research, Cielo. This closes any questions about this issue, and opens up even more evidence that Watson was unfortunately all too eager to please his superiors. That was always obvious. But now it’s a known fact that his denials were always a bunch of B.S. I had heard that Tex was the one who introduced Manson to Dennis Wilson. Nah, Tex actually was introduced to Manson by Dennis Wilson. Wilson met Charlie when he picked up Ella Jo and Katie Krenwinkel hitchhiking. Does anyone know if Dean Moorhouse was related to RuthAnn Moorhouse? When I see picture of Dennis Wilson’s house today….they always show a Log Cabin…that’s what they show in the DVD “Six Degrees of Helter Skelter”….on Google they show a Big White Mansion….which is it? The one that Charlie and the girls stayed at? Let me know please….feel free to email me. Actually, according to Rudi Altobelli, it was 1969. Melcher and Bergen moved out that January.